HIV tests are are not only unreliable - they have been tweaked to respond to protein fractions found most often in those people that are part of AIDS "risk groups", says Neville Hodgkinson, author of AIDS: The Failure of Contemporary Science in his latest article published last Sunday (21 May 2006) in The Business. One story Hodgkinson relates in his thoughtful article is how the symbol of HIV infection - and certain AIDS death - was rejected in India and a national campaign abandoned, when "in front of television cameras, a six-foot red ribbon was cut into pieces as a protest against the 'oppressive and patronising' symbol." Veena Dhari, the first woman in India to declare herself HIV-positive, said that when HIV-positive people see the ribbon “we feel like committing suicide”. Quite apart from the personal tragedies of people being labeled 'HIV positive' and effectively receiving a death sentence, the unreliability of the test, which makes such labeling a cruel if not criminal act, is becoming a major issue. Hodgkinson is not the only journalist saying that the retrovirus which supposedly causes AIDS is not being detected by tests, and indeed has never been properly identified as the cause of the syndrome. Liam Scheff has contested more than a year ago, that no gold standard exists for the AIDS test, that is, the test cannot be validated against an actual virus isolated from patients that have the disease. And Rebecca Culshaw, a mathematical biologist and assistant professor of mathematics says she quit her AIDS related work because of the substantial impossibility to model the spread of the disease and the effectiveness of preventive and curative efforts: "The biological assumptions on which the models were based varied from author to author, and this made no sense to me." As if a bogus test was not enough, the treatment recommended after the verdict of "positive" virtually guarantees debilitating illness and eventual death. The "side effects" of the retroviral drugs which are the treatment 'of choice' include the very symptoms we describe as AIDS. The iconoclastic Harper’s article, entitled "Out of Control: Aids and the corruption of medical science", has sparked intense debate. Greeted by a chorus of condemnation and calls for the resignation of Harper’s editor, it has nevertheless found many defenders. 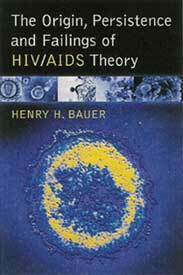 It was written by Celia Farber, a journalist and long-standing critic of the science surrounding the HIV theory. "HIV tests were highly accurate from the time they were developed in 1984" claimed the advocates of the HIV causation theory of AIDS. Why only accurate? If HIV causes AIDS, it ought to specific, like all other antibody tests. Why is there an exception for AIDS? If a specific virus causes AIDS, why is is there no vaccine yet? It supports the fact that there is no specific viral cause for AIDS. Even Dr. Gallo's paper merely "suggests that HTLV-III may be the primary cause of AIDS" (Gallo et al, 1984, Frequent detection and isolation of cytopathic retroviruses (HTLV-III) from patients with AIDS and at risk for AIDS, Pubmed, May 4;224(4648):500-3). As I predicted (see: AIDS, NON-HIV AIDS AND PRESCRIPTION AIDS), there will never be a vaccine for AIDS - "The only logical hypothesis is that toxic chemicals, whether or not they are approved for medication, if they generate free radicals in the body that decrease white blood cell count or kill T4 cells or damage the cell walls of cells of the immune system or the endocrine system will generate AIDS. It results in immune deficiencies or immune disorders or damage to the genetic material and explains the variation of the symptoms of AIDS and that also means there will be no such thing as an AIDS vaccine". How can there be a vaccine for a condition that is precipitated by excess free radicals? Forty years ago, the so called risk group in poor societies was treated for malnourishment. Today they are treated with toxic retrovirals and a poison called AZT (which is toxic by inhalation, which means that without HIV=AIDS, if you inhaled AZT, you must be treated for the toxic exposure). But today AZT is medicine! If AIDS was caused primarily by a virus as deadly as they said it was, the mathematical model would clearly show that to be the case but it proves otherwise. You might recall that the media at one time said that mathematical models predicted that entire African nations would be wiped out by AIDS. The circular reasoning as brought out by this article is sufficient to call on the "bogus" nature of HIV tests but they help to sell retrovirals and AZT. The circular reasoning appears sound but there is science to suggest or even clearly indicate that the Gallo isolate does not contain a virus but possibly polymer actin proteins produced by white blood cells under oxidative stress, the kind of oxidative stress found in malnourished people and in people recovering from malaria or flu etc. The antibodies in such people are an auto-immune response of their body to these polymer proteins. Hence they respond clinically to proper nutritional interventions (see: Are Malnutrition and Oxidative Stress the Cause of gp41, gp120 and gp160 in Robert Gallo's HIV Isolate?). Medical science, as it presents itself today, is largely a treatment science wherein disease conditions are to be treated with drugs having abandoned health science which is about restoring health through biomolecules that promote and restore cellular function. This chronic deviation is slowly and progressively repositioning toxic drugs and chemicals as clinically useful and later on as harmless or even beneficial for people who have not yet developed any symptoms. As a strategy, toxic drugs appear to be moving in that cycle and AZT is a good example that has dogmatic support (see; Can I have my chemo supplement please?). The National Institute of Allergy and Infectious Diseases (NIAID) and other branches of the Public Health Service (PHS), claim that AZT was beneficial for "HIV-infected�?? persons with "mild symptoms of immune system damage�?? and also for "HIV- infected persons who have not yet developed symptoms�?? (AZT and Cancer, New York Native, 1987 October 19th, John Lauritsen). And the silver lining on the use of AZT is that it can preciptate conditions as seen in AIDS patients! which means that is immunosuppressive itself. So, there is bigger picture then pure medical scandal because it involves institutional and political support? Hence AIDS is not just a tragic error but a well managed medical business that has become a nightmare for health. "Dr Robert Gallo, the American government researcher whose team developed and marketed the first test kits, says in a letter in this month's Harper's that "no test in medicine is perfect, but done correctly and with a confirmatory second test, the HIV blood test developed in our laboratory comes close." Firstly, it is a scientific admission that his test is not virus specific. Perhaps he is trying to convey the truth about the HIV tests. Secondly, he says that you need a second confirmatory test. There is no confirmatory test as all of those "tests" carry the same disclaimer! So, a proper scrutiny of his statement as herein recorded in the article above, proves, even on legal analysis, that there is no virus specific test to prove a viral cause and it needs a confirmatory test. Who has this confirmatory test? No one. In that context, look at the dissident scientific view that questions the isolation of the HIV virus, which is supposed to be big and complex but remains illusive. Then you get the whole perspective falling in place when looked at the fact Dr. Gallo offered no scientific proof of a virus as the specific cause of AIDS but said that it "may" be the primary cause of AIDS. When he says, you need a confirmatory test, it puts another guy in business. And this other guy puts the same disclaimer on his test kit. That is a notorious example of modern science in business. A fictitious viral disease to be diagnosed by tests that cannot confirm and to be treated by a toxic poison that is "beneficial for "HIV-infected�?? persons with "mild symptoms of immune system damage�?? and also for "HIV- infected persons who have not yet developed symptoms." The morale of the story - science is enlightening but science can make suckers. There was an interesting comment on an article on Indimedia Ireland Why Bono And HIV/AIDS Inc. Will Be Stopped by Cal but it appears to have been \"lost\", i.e. someone (accidentally?) deleted it. \"OK ... I\'m precisely going through the flaws in the HIV tests. The first is the Reverse Transcriptase test or viral load test. \"Reverse Transcriptase from HIV-1 is of tremendous medical interest as it is the target enzyme for the best known of anti-AIDS drugs, AZT, which acts by causing chain termination of the polymerase reaction.\"
The problem is that our genome contains 8 retrovirus in our DNA and these endogenous retroviruses also use Reverse Transcriptase, so how do we tell if it\'s our own HERVs or HIV. It all depends on the HIV antibody test to confirm if it is HIV Reverse Transcriptase. \"Phylogenetic analyses of retroviral elements, including endogenous retroviruses, have relied essentially on the retroviral pol gene expressing the highly conserved reverse transcriptase. This enzyme is essential for the life cycle of all retroid elements, but other genes are also endowed with conserved essential functions. Among them, the transmembrane (TM) subunit of the envelope gene is involved in virus entry through membrane fusion.\"
\"A major core protein of the human immunodeficiency virus encoded by the HIV gag gene. HIV-seropositive individuals mount a significant immune response to p24 and thus detection of antibodies to p24 is one basis for determining HIV infection by ELISA and Western blot assays.\"
But everyone who consumes milk products or eats cattle will be exposed to the p24 of the Bovine Leukemia Virus and also can test positive to the test. \"Using immunoblotting to test the sera of 257 humans for antibodies of four isotypes (IgG1, IgM, IgA, and IgG4) to the BLV capsid antigen (p24), we detected at least one antibody isotype reactive with BLV in 74 of the human sera tested.\"
And anyone with lupus or hyperthyroid autoimmune diseases can also test positive to p24. These diseases also have the similar symptoms to so called HIV infection. \"We have previously demonstrated that about one-third of patients with either Sj�gren\'s syndrome (SS) or systemic lupus erythematosus (SLE) react to human immunodeficiency virus (HIV) p24 core protein antigen without any evidence of exposure to, or infection with, HIV itself.\"
This is where it gets terrifying, I have in the last month swapped emails with a pregnant lady diagnosed with HIV, she was given all sorts of medication and also put under great pressure to take abortion pills which she did. She then re-tested and came up negative. The reason for the positive cross-reaction with the test is due to the endogenous retrovirus HERV-W which is involved in attaching the fetus to the placenta, within the HERV-W is a gp24 transmembrane subunit. GP stands for glycoprotein and is shortened to protein when called P24, they are the same and react to an antigen test. \"Syncytin is a fusogenic protein involved in the formation of the placental syncytiotrophoblast layer. This protein is encoded by the envelope gene of the ERVWE1 proviral locus belonging to the human endogenous retrovirus W (HERV-W) family. The HERV-W infectious ancestor entered the primate lineage 25 to 40 million years ago. Although the syncytin fusion property has been clearly demonstrated, little is known about this cellular protein maturation process with respect to classical infectious retrovirus envelope proteins. Here we show that the cellular syncytin protein is synthesized as a glycosylated gPr73 precursor cleaved into two mature proteins, a gp50 surface subunit (SU) and a gp24 transmembrane subunit (TM).\"
At the beginning of pregnancy a wave of de-methylation occurs and this is a normal part of pregnancy, this is also why the retroviruses come out of the genome and get active. They are not a disease though, they have function. Of course a drug like AZT which they give to pregnant women worldwide completely wrecks this process. Hypomethylation affects T-cells as well as makes retroviruses come out of our DNA. The T-cell test is really picking up changes in T-cell counts attributed to other real infections and problems with Methylation due to a lack of nutrients needed to Methylate. It is not HIV causing the lowered count. \"Procainamide and hydralazine inhibit T cell DNA methylation and induce autoreactivity in cloned CD4+ T cells. These drugs also induce an autoimmune syndrome, suggesting a possible relationship between DNA hypomethylation, T cell autoreactivity, and certain autoimmune diseases. To test this relationship, DNA methylation was studied in T cells from patients with rheumatoid arthritis and patients with systemic lupus erythematosus, and was found to be impaired. These results support a relationship between DNA hypomethylation and some forms of autoimmune disease.\"
Evidence for impaired T cell DNA methylation in systemic lupus erythematosus and rheumatoid arthritis. \"DNA methylation plays an essential role in maintaining T-cell function. A growing body of literature indicates that failure to maintain DNA methylation levels and patterns in mature T cells can result in T-cell autoreactivity in vitro and autoimmunity in vivo. Defective maintenance of DNA methylation may be caused by drugs such as procainamide or hydralazine, or failure to activate the genes encoding maintenance DNA methyltransferases during mitosis, resulting in the development of a lupus-like disease or perhaps other autoimmune disorders. This paper reviews the evidence supporting a role for abnormal T-cell DNA methylation in causing autoimmunity in an animal model of drug-induced lupus, and discusses some of the mechanisms involved. T cells from patients with active lupus have evidence for most if not all of the same methylation abnormalities, suggesting that abnormal DNA methylation plays a role in idiopathic human lupus as well.\"
DNA methylation and autoimmune disease. \"Thus, the HIV LTR appears to be susceptible to transcriptional inactivation by methylation, a process that is proposed to play a modulatory role in viral latency.\"
And researchers are looking at drug therapies to Methylate HIV and stop it. The main nutrient needed for Methylation is Selenium and this is probably why low Glutathione (a Selenium compound) is an indicator of AIDS progression. Nothing changed in the early 80s, the tests picked up retroviruses that came out when gays using Amyl Nitrate had depleted their bodies of Methylation Nutrients. The HIV tests themselves have been the source of the epidemic. It\'s up to the scientists now to go back to the drawing board and find a way out of this without massive litigation crippling the biomedical industry. More if curious ... I've written about it in detail. Have a good day all.\"
1) The article was all about HIV test scandal in India? Did you mean that HIV test kits were fake and bogus, not approved by FDA and not reliable in India?? OR did you mean HIV tests all over the world are fake?? 2) I read the article also. There was an issue that HIV-positive people in India were thinking that HIV tests would diagnose AIDS but that is untrue. Am I right?? I would really appreciate if you answer my questions as I think I misinterpreted the article by thinking that HIV tests all over the world are bogus and fake. I am very worried and almost crying. Waiting for your reply soon. ...it seems that if you can get the standard insert for the tests, it actually states that the test may not be used to diagnose AIDS, that AIDS can only be diagnosed from the presence of clinical signs. Of course you have to make up your own mind. All I can do is to point to inconsistencies in the official data. What you do in your life is entirely up to you. Don\'t take my word for anything. Go and research. You have the internet at your command. All the data are there if you just start looking. \"Counseling people at low risk [wealthy, white, heterosexual] requires paying particular attention to false positives, that is, to the possibility that the client has a positive HIV test even though he or she is not infected with the virus.�If clients are not informed about this fact, they tend to believe that a positive test means that they are infected with absolute certainty�. Emotional pain and lives can be saved if counselors inform the clients about the possibility of false positives.\"
\"Serologic tests for HIV antibodies appear to be characterized by extra-ordinarily high false � positive results in a low risk screening setting of voluntary blood donation1 Furthermore, any increase in false positive rate could turn a screening program into a social catastrophe. A false positive result may label an infant, born to HIV positive mother, as HIV positive where as the same infant may actually be HIV negative.2 The false positive result regarding HIV in a neonate can lead to very serious problems.\"
What Gallo did before HTLV-III. Fantasical Correlations! Unfounded Suppositions! Gallo Gallo Gallo!! \"Heterophile antibodies are a well-recognized cause of erroneous results in immunoassays. We describe here a 22-month-old child with heterophile antibodies reactive with bovine serum albumin and caprine proteins causing false-positive results to human immunodeficiency virus type 1 and other infectious serology testing.\"
\"We describe here a case of heterophile antibodies that are cross-reactive with bovine [cow] and caprine [goat] proteins occurring in a 22-month-old child, causing false-positive immunoassay results to human immunodeficiency virus type 1 (HIV-1) and a number of other infectious serology tests.\"
\"Retroviruses have been isolated from a wide variety of species including humans�Immunoblotting (Western blot) is routinely used for detection of antibodies in human sera against HIV proteins.\"
\"A total of 144 dog sera were tested on Chiron Western blot strips. Of these, 72 sera (50) reacted with one or more HIV recombinant proteins.\"
\"Some canine sera contain antibodies that cross-react with different HIV structural proteins and to a limited degree with SIV (mac) core protein.\"
\"The majority of the sera reacted with the HIV core protein, although some sera reacted with more than one protein, which indicates a specific rather than a nonspecific reaction.\"
* \"Alloimmune mice (mice that have been exposed to cells from another murine [mouse] strain) were shown to make antibodies against gp 120 and p24 of human immunodeficiency virus (HIV), and mice of the autoimmune strains MRL-_tpr/lpr_ and MRL-+/+ made antibodies against gp120. * This is surprising because the mice were not exposed to HIV.\"
\"Investigators from the European Collaborative Study noted a \"worrying\" increase in severe pregnancy-related adverse events in HIV-positive women taking HAART, including the death of their babies during the early weeks of life and described adverse outcomes during pregnancy amongst women taking HAART. Fun with numbers, lies, pain, loss, deception and death.... It\'s Aids, incorporated.